Above: Photos of The Four Tunes from 1967. 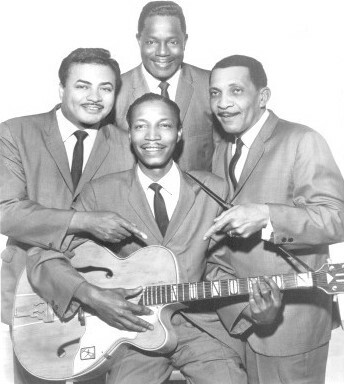 (Left Photo, Top-Bottom) Gaines Steele (tenor), Pat Best (baritone & guitar), Jim Gordon (bass), and Billy Wells (tenor). 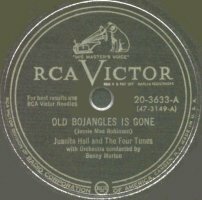 The original members (featured on this week's record) were Best, Gordon, Danny Owens (tenor), and Jimmie Nabbie (tenor). Best is the only surviving original member. Click HERE for an article about The Brown Dots/Four Tunes by Marv Goldberg. Above: Label image of Manor 1087-A. The flip, "Dreams", is without Betty Harris. 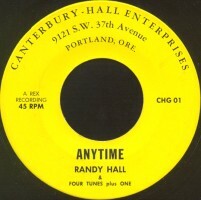 Above: The Four Tunes also backed up Savannah Churchill (1946-51), Juanita Hall (1950), and Randy Hall (196?). 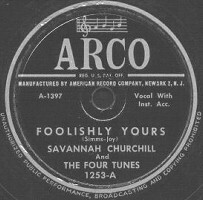 The Cats And The Fiddle backed up June Davis on one Manor release in 1946. The Brown Dots backed up Gwen Bell on one Manor release in 1949.